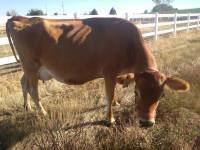 Violet is our gentle Jersey Cow. She is our sweet herd mother. 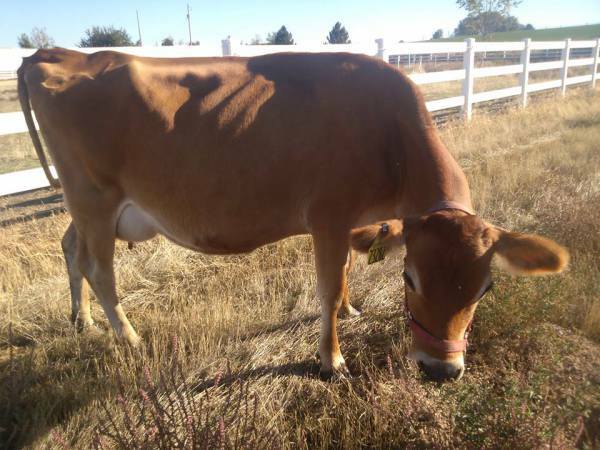 We purchased her in Oct. 2014 from the Ottmar family in Hermiston, Oregon. 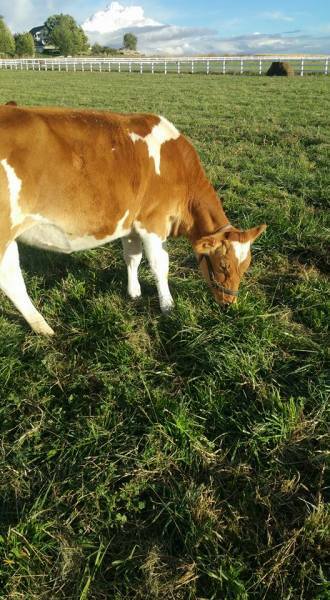 They lovingly raised and trained Violet and we feel so blessed to have such a wonderful milk cow! She has given us 2 beautiful heifers so far -- Daisy Belle (10/14/15) and Lady-O (10/1/2017). She was bred on Aug 8 2018 to an A2A2 Jersey Bull, 1JE909 Bailey hoping for a calf May 17th 2019. 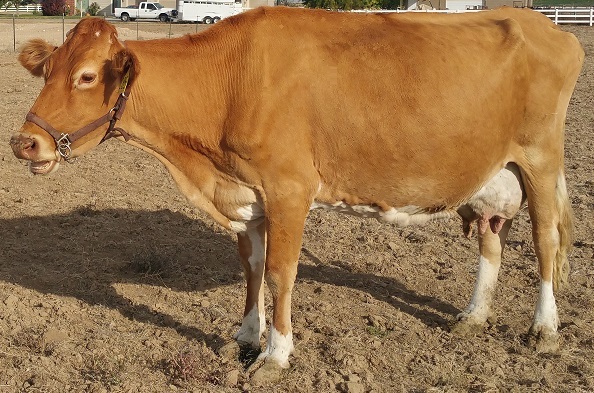 Farewell to our wonderful Teena "Rose"
Last spring (2017) we sold our guernsey Teena Rose to a good family in Jordan Valley Oregon. 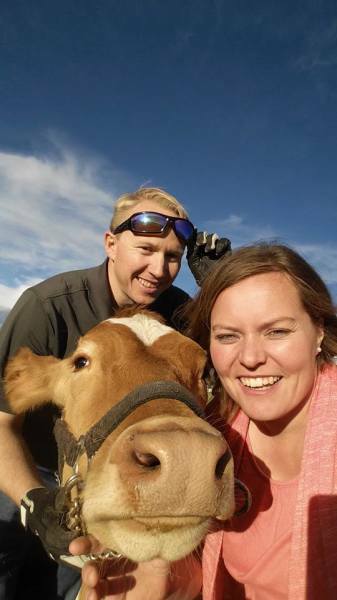 We will miss her dearly and are praying that she will be a wonderful cow for their family. We are so grateful she gave us Honey to remember her by! We jut love it out here at Sunnydale Farms! We just got our pasture in this last fall and it is looking good! 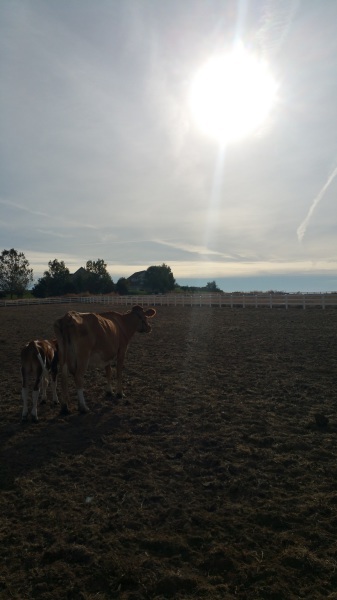 Cows have been our favorite pet of all time and we enjoy having them here on our farm and the delicious milk they share. Feel free to ask us any questions! 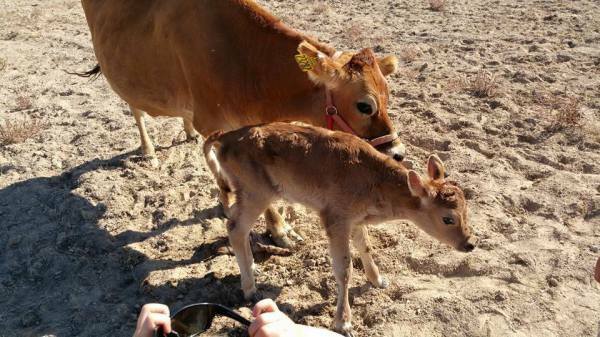 Daisy Belle is Violet's calf born on October 14th, 2015. This is a picture of her as a baby calf but she is full grown now and had her first calf last fall! She is becoming a wonderful milk cow and gives delicious A2A2 milk. We love singing her song to her "Daisy, Daisy, Tell me your answer true. I'm half crazy all for the love of you ...." She was bred on January 16, 2018 to a Black Angus Bull, Eathington Sub-Zero 1AN01298 and is due to calf October 25 - just in time for Halloween! Lady O was born to Violet on 10/1/2017 and we are so grateful for her! She is a cross between our cow Violet and A2A2 Guernsey Bull Lang Haven Grumpy Novak. She is all legs right now (She will be tall!) and so very sweet! Charlie is our darling Angus/Jersey bull calf born on September 7th 2017 to Daisy Belle. His father is Red Angus bull - Bieber Rouse Samurai 7AR60. He loves to eat and is so very strong! It is fun watching him run with our other calf LadyO - His aunt. Us and Honey! She is a sweetheart! 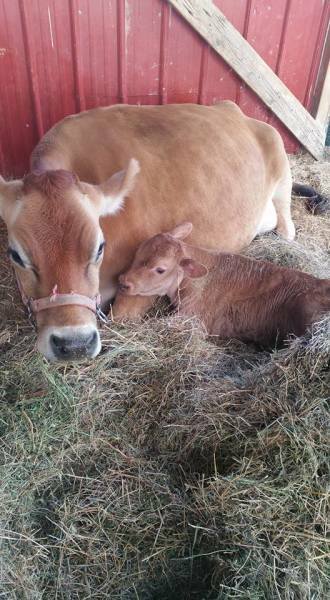 Honey, our registered Guernsey a2a2 heifer calf, was born Dec 15, 2016 to Teena. She is such a little darling! We are enjoying watching her run and grow and feel so grateful to be blessed with this sweet little heifer. 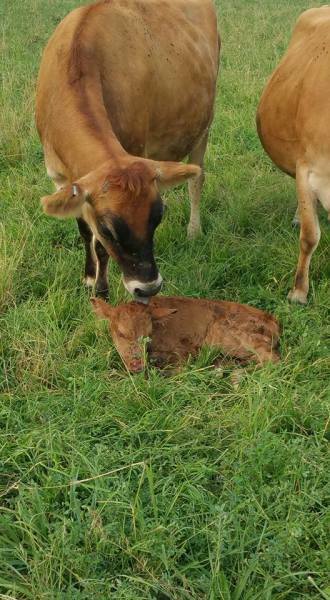 She was bred December 8th to A2A2 Jersey Bull: HiLand Score Formidable 1JE00992 and calved Sept 15th with her first little calf - a sweet little heifer named Bella Rose!